So, What's in this Stuff? — Frenchie's Fabulous Nut Co. While we can't give away the recipe, we can divulge the ingredients! 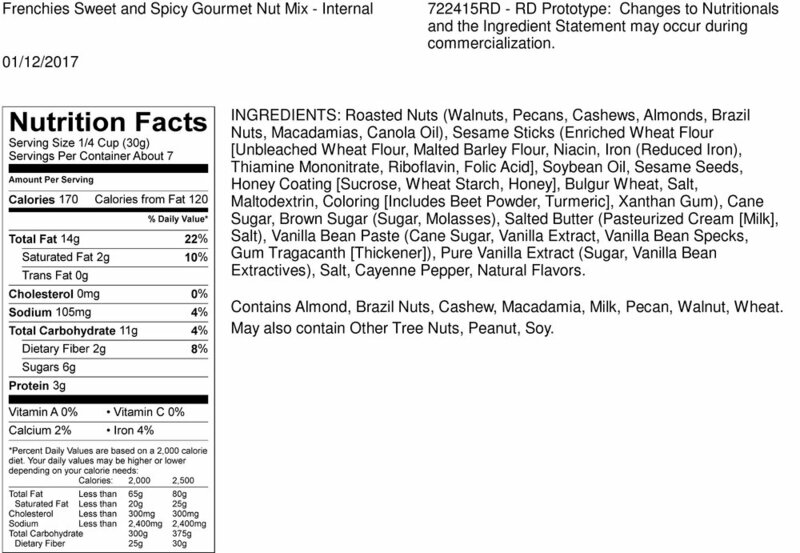 Almonds, Brazil Nuts, Cashew, Macadamia Nuts, Pecans, Walnuts, Honey Roasted Sesame Sticks (no peanuts). Vanilla Bean Sugar, Butter, Dark Brown Sugar, Full Flavor Molasses, Vanilla Bean Paste, Madagascar Bourbon Vanilla Extract, and a kiss of Cayenne Pepper.